Join arts wave devon Dawlish Journeys for our celebration event STEAM: Dawlish Local Line. Meet us outside Dawlish Train Station to start the journey at 4.30pm. If you arrive by train into Dawlish between 4.15-4.46pm you will be greeted by The South Devon Singers and some free mince pies to welcome you to the celebration. You may also notice The Dawlish Dancers (over 55s group) outside Geronimo’s cafe causing a stir in red. From 4.45pm follow our lantern parade, with children from Gatehouse, Kenn Church of England and Kenton Primary Schools and the Home Educated Network with their specially made beacons to light the way to the piazza. From 4.50pm at the piazza you will find outdoor dance/parkour performance by The Urban Playground Team with performers from South Devon College accompanied by the South Devon Singers. From 5pm Father Christmas will lead the way as the community process to the bandstand. At the bandstand you will find a host of festive activities and performances, including Westcliffe School Choir. Warm up with a free glass of hot chocolate or mulled wine, or a free hot dog (for children) and get ready for the Mayor to switch on the Christmas Lights at 6pm. 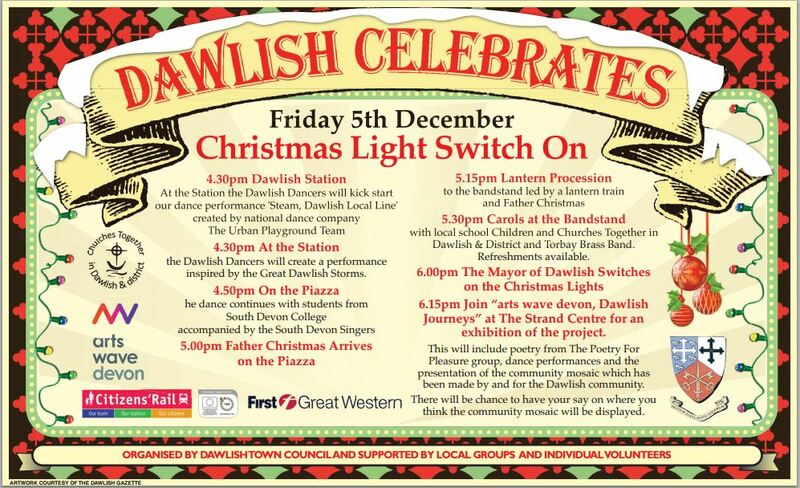 After the big switch on, join us in The Strand Centre (United Reform Church) for dance performances by Cockwood Primary, Dawlish Community College and South Devon College. There will also be an exhibition of poetry from our Poetry for Pleasure group on the theme of Dawlish Journeys. We will also have our Dawlish Journeys Community Mosaic on display. The mosaic has been designed by local children and made by participants of all ages including ‘No Limits’ group at Red Rock, home educated children, Cockwood Primary and visitors to The Strand Centre. We will be asking for YOUR suggestions for where you would like to see the mosaic on display in Dawlish. This event will finish at 7pm. We look forward to seeing you this Friday, as we celebrate Dawlish Journeys! In very bad weather – join us in The Strand Centre. Times listed are a guide for audiences to find us along the journey and should be considered as best estimates.